What tax might you pay on pension withdrawals if an emergency tax code is used? Use the calculator below to estimate how much tax might be deducted from your pension withdrawals under emergency rate tax. 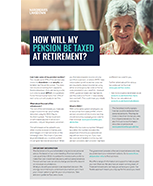 This will be the case if your pension provider has not received a current valid P45 or you have not had a personal tax code confirmed by HMRC to your pension provider. With drawdown, any tax-free cash required is taken when you first move into drawdown and the remaining income withdrawals are taxable. With an UFPLS (Uncrystallised Funds Pension Lump Sum), 25% of the lump sum withdrawal will normally be tax free and the rest taxable. Use this simple calculator to estimate the tax which might be deducted if an emergency tax code is used. Free Factsheet: How are pension withdrawals taxed? Important information - This calculator provides you with an indication of the tax which might be deducted if an emergency tax code is used for a payment made in the 2019/20 tax year based on the latest information provided by HM Revenue & Customs (HMRC) as at 1 April 2019. The tax deducted using an emergency tax code does not indicate the tax you may owe due to the payment. The actual tax deducted from any payment will depend on the tax code specified by HMRC and the value of your payment. The calculations assume that 25% of your UFPLS payment will be paid tax free, but if you have reached age 75 and have insufficient lifetime allowance, this percentage will be lower. In some circumstances, you might not be able to withdraw a lump sum without moving into drawdown first. The calculator does not confirm that such a lump sum is available to you, nor does it consider any implications of taking this lump sum, for example any impact on capital gains tax, inheritance tax or on any means tested benefits. Once HMRC has confirmed your tax code to your pension provider future payments should be taxed using this code. Use our pension income tax calculator to estimate how much tax might be deducted from pension withdrawals using the standard personal allowance and respective income tax bands. The information on our website is not personal advice but we can offer advice if specifically requested. What you do with your pension is an important decision, which could be irreversible. Make sure you understand your options and check they are suitable for your circumstances: take appropriate advice or guidance if you are unsure. The Government's free Pension Wise service can help. It provides impartial guidance face-to-face, online or by phone - more on Pension Wise.